Synaptogenesis involves clustering of presynaptic and postsynaptic components at sites of initial contact40-47. This includes recruitment of the presynaptic release machinery, postsynaptic neurotransmitter receptors, and associated signaling molecules (see Chapters 14 and 16). Clustering of different proteins to presynaptic and postsynaptic sites suggests involvement of heterotypic trans-synaptic adhesion molecules, and their associated scaffolding and signaling proteins. These trans-synaptic signals would also require specificity, the ability to recruit the appropriate neurotransmitter on the presynaptic side and their cognate receptors on the postsynaptic side, in order to avoid mismatching. In the late 1970s Banker and colleagues developed a culture system for the study of isolated hippocampal neurons. Examination of hippocampal neurons in culture reveals that they rapidly attach to the artificial extracellular matrix and begin to extend processes within 24-48 h48,49. A large proportion of the cells in culture mature to resemble typical hippocampal pyramidal cells in vivo, bearing polarized processes emerging from their triangular-shaped cell bodies. Cultured neurons provide many advantages over intact specimens for microscopic imaging. Dissociated cell cultures are optically accessible, with little to no overlap between individual cell components, allowing for easier interpretation of results. In addition, cultured cells are more accessible for labeling or loading with markers for imaging. Imaging in cell culture was revolutionized by the advent of fluorescent proteins, such as green fluorescent protein (GFP). Many live time-lapse imaging studies of synaptogenesis take advantage of direct fusion of a fluorescent marker to their protein of interest, revealing the time course and organization of molecules in synapse formation. Further understanding of the molecules involved in synapse formation has been gained by fixing the culture after the time-lapse imaging and conducting retrospective immunohistochemistry. Likewise, the ultrastructure of newly formed or developing synapses can be examined using retrospective electron microscopy. Additional tools useful in live imaging are styryl dyes (FM-4-64) which permit visualization of vesicle turnover, an important indicator of a functional synapse. These dyes are washed into the culture media, and are taken up when vesicles fuse with the cell membrane and are re-endocytosed. Following uptake, when the dye has been washed out, presynaptic compartments that contain recycled synaptic vesicles will remain labeled, signifying that they are active. In addition, live imaging studies allowed observation of initial contact events between outgrowing axons and dendritic filopodia. These approaches have given us insights into which compartments initiate contact, and what structures or events developmentally precede synapse maturation. 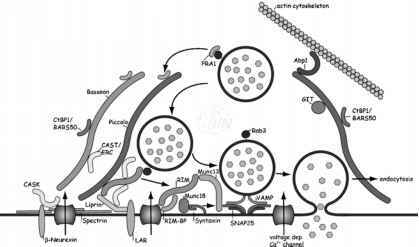 Such approaches also allowed visualization of the recruitment of transport packets containing presynaptic proteins such as synaptophysin at initial sites of contact (Figure 4.5).